Here’s a recipe that allows you to indulge in something sweet, cold and creamy without the sugar rush. 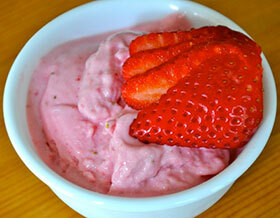 Non-fat Greek yogurt is packed with protein, which makes this delicious snack even more beneficial. Feel free to add Stevia In The Raw to increase the sweetness as described below. Wash and hull the strawberries. Mix in a blender until smooth. Add yogurt (and Stevia In The Raw, if using) and blend well. Pour into an ice cream maker and run until yogurt is frozen and creamy. Nutritional Analysis: One serving equals: 87 calories, 0g fat, 53mg sodium, 9g carbohydrate, 1g fiber, and 13g protein. You know that soda pop isn’t good for you…and yet you still drink it. I understand that plain water gets boring – especially when you’re having a party or gathering. Meanwhile, in a large bowl combine the cabbage, onion, cilantro and remaining 1/4 cup lime juice. Season with salt and pepper to taste. Cover and refrigerate for 4 hours. Preheat oven to 400 degrees F. Roast the chicken legs for 40 minutes. When the chicken has cooled, discard the skin and bones and shred the chicken. 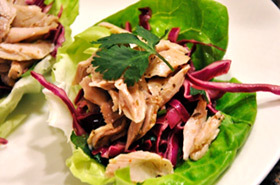 Fill each lettuce leaf with a spoonful of cabbage mixture, topped with shredded chicken. Nutritional Analysis: One serving equals: 248 calories, 12 fat, 740mg sodium, 5g carbohydrate, 2g fiber, and 26.7g protein. There’s a good chance that you’ll find yourself in a coffee shop looking for refreshment at one time or another this summer. It may even be a daily occurrence! Keep in mind that what you order will directly impact how you look and feel. Order something that will cool you off, not weigh you down. This means only drinking beverages that contain little to no sugar. Blended drinks are packed with sugar – making this the worst choice. Imagine that blended coffee drinks are a dessert-in-a-cup – because it will end up stored on your body as quickly as a slice of cheesecake. Unsweetened or lightly sweetened iced tea is an excellent choice. Unsweetened or lightly sweetened iced coffee is also an excellent choice. 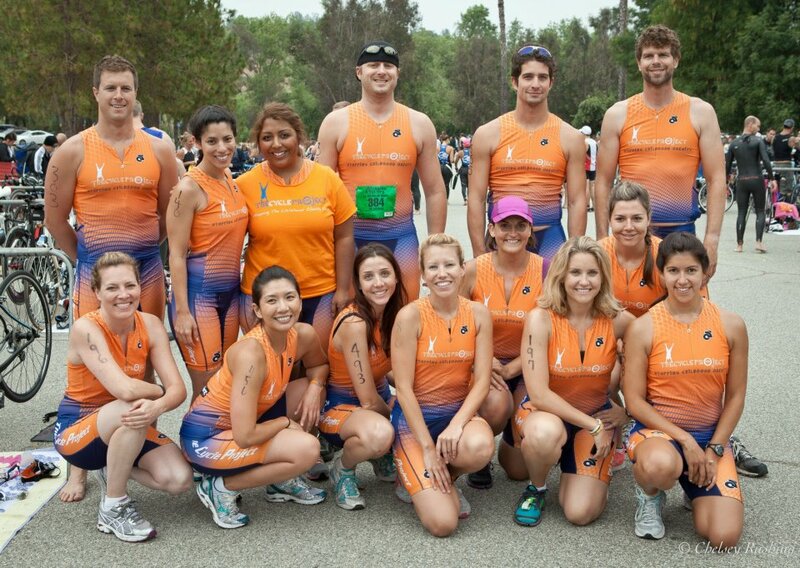 This was the first of many races The Cycle Project competed in as a team! When we talk about the benefits of exercise, looking better gets the most attention. Burning off unwanted pounds is a great thing, but let’s not overlook a more immediate benefit of exercise. Exercise transforms how you feel—with a quickness. It’s true. While weight loss takes time and extended effort, all it takes is one workout to begin reaping the reward of a more energetic and capable body. How are your energy levels these days? Do your eyes pop open at the sound of your alarm? Then do you bounce through your day with a spring in your step? Or do you hit snooze half a dozen times before getting up and dragging through your day? While you may not instantly feel like the Energizer Bunny, your energy levels will dramatically increase once you begin a consistent, challenging exercise routine. How does spending energy create more energy? “(Exercise) literally creates energy in your body. Your body rises up to meet the challenge for more energy by becoming stronger,” explains Samantha Heller MS, RD. Research consistently concludes that regular exercise increases energy levels and reduces fatigue. When your life becomes sedentary (this means you are inactive for most of the day) then you’ll quickly find your body developing aches and pains. You’ll feel it when you stand up – a throb in your back, creaking in your knees and stiffness in your legs. This is pain due to underuse. Your body was meant to move! Movement improves flexibility and range of motion, and releases natural pain-reducing endorphins, which means that, with a regular exercise program, you’ll be moving smoother and with less pain than ever before. It’s hard to understand how 30 to 60 minutes a day spent on exercise is able to completely transform how you feel about yourself. But it does. Think back to the last time that you accomplished something. Maybe you performed well at work and received kudos from your boss, or you finished a project at home that took weeks of your time and concentration. Do you remember how that accomplishment made you feel? You stood a little bit straighter, you smiled easily, and deep down you felt alive with excitement. When challenging exercise becomes a regular part of your life, feelings of happiness and confidence also become a part of you. From now on I want you to forget the idea that exercise is nothing more than a means to achieving a slimmer body. Instead, look at exercise as a complete life enhancer. I’d love to get a call or an email from you. Reach out to me and I’ll show you how to integrate a consistent, challenging exercise routine into your lifestyle so that you’ll begin to reap the benefits of an energetic, more confident you. Don’t wait to begin enjoying the benefits of an active lifestyle – call or email now! 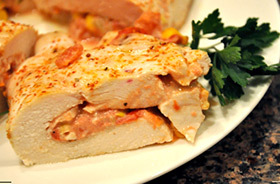 Slice through the thick part of each chicken breast so that it opens like a book. Double wrap the chicken with plastic wrap and out it with a meat until it’s 1/4 inch thick. Season one side of each chicken breast with salt and pepper, then flip it over and spread with 1/4 of the cream cheese filling. Roll each chicken breast up and place it seam side down in a baking dish. Rub a little olive oil over the top of the chicken then season with Tajin and salt and pepper. Cover and bake for 35 minutes. Remove the cover and bake for another 15 minutes. Thinly slice and then serve. Nutritional Analysis: One serving equals: 234 calories, 6g fat, 522mg sodium, 13g carbohydrate, 3g fiber, and 31g protein. Vacation days are notorious for carb-rich meals, and it’s a well-known fact that too many carbohydrates will quickly add up to unwanted pounds. Combat this fat-trap by choosing to eat one carb-less meal each day. Breakfast: This may be the most effective meal to use the carb-less trick, since breakfast often involves breads, pastries and pancakes. Skip the toast and fill up on egg whites and lean breakfast meats. Vacations are a time to get away from the grind of everyday life – to indulge mind and body in relaxation and enjoyment. Unfortunately all that indulgence typically leads to a pound gained for each day that you’re away. To help you combat these unwanted pounds, I’ve identified the 5 main reasons that people gain weight on vacation, as well as your strategic plan of avoidance. Let’s face it, the vacation mindset is a set-up for gaining pounds. Your priority is to relax, and for most that means eating, resting and forgetting the gym. There’s nothing like a vacation to cause you to throw all caution to the wind with indulgent snacking. Ice cream in the middle of the day, frozen coffee drinks topped with whipped cream, salty bags of chips and even a visit through a fast food drive thru. You have no choice but to dine out while on vacation and whether you’re visiting 5 star restaurants or fast food diners, you’re going to face the same problem: large portions. While the easiest thing to do with a big plate of food is to simply eat it all—you are on vacation after all…right?—that isn’t the best for your waist. When you order your meal ask the waiter or waitress to bring you a to-go box. Take half of your meal and place it safely into the box before you even begin to eat. If you would rather not carry around a to-go box then ask that your entrée be made into a smaller portion. If it is dinnertime ask for the lunch-sized entrée. You won’t be rushing home, trying to squeeze in a few minutes at the gym, but rather the vacation workout can be a relaxing and enjoyable experience. Virtually every hotel these days has some type of workout room equipped with cardio machines, dumbbells and a universal machine, so make good use out of it. Vacations are also a great time to take your workout outdoors; take a run on the beach or do sprints, pushups and crunches on a grassy field. If you want more ideas of workouts you can do using just your body weight then give me a call or send me an email. Make a conscious effort to be active everyday. Go on a brisk walk after your day’s activities. This is a great way to see a new city, and also a great way to burn off extra calories. Take the stairs instead of elevator in your hotel and any other buildings you visit. Go on a short jog in the mornings or evenings of your stay. If your hotel has a pool, swim a few laps each morning or evening. Enjoy your vacation! And when you get back into town call or email me for a fitness and fat loss consultation and I’ll show you a step-by-step plan for getting you the body that you deserve – it’s easier than you think.